Every company needs great managers to achieve its strategic and performance goals, but the competition to attract and retain them is brutal. Only one in 10 people have the natural talent to manage a team of people, and just two in 10 people possess any characteristics of managerial talent. What's more, Gallup has consistently found that engaged managers, like engaged employees, are much less likely to leave companies than their actively disengaged counterparts. But only 35% of managers are engaged in their jobs, a study of more than 2,500 managers reveals. Though employees have the primary responsibility for their own engagement -- and their team's -- Gallup estimates that managers account for at least 70% of the variance in employee engagement scores across business units. Managers' influence on employee engagement is vital to a team's success. Employees who are supervised by a highly engaged manager are 59% more likely to be engaged than those supervised by an actively disengaged manager. An engaged manager supervising engaged employees leads to increased productivity, better-quality work and lower turnover. Having low engagement at the managerial level reveals an urgent need for companies to retain their top-performing and engaged performers. One effective strategy to encourage retention is to focus on improving managers' well-being. 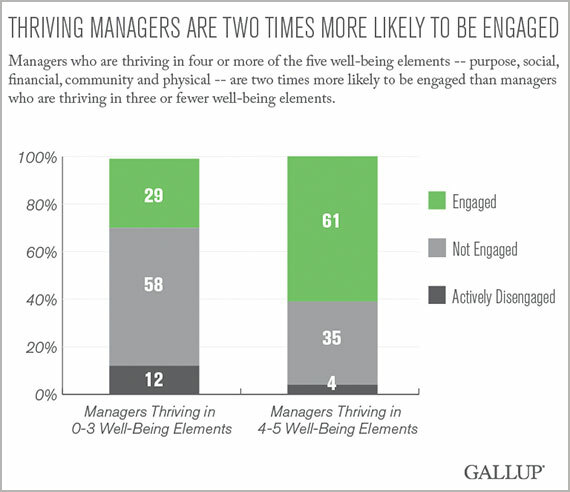 Managers with high well-being are twice as likely to be engaged at work, Gallup research shows. Gallup also found that managers who are thriving in four or more of the five well-being elements -- purpose, social, financial, community and physical -- are more likely to strongly agree with each of Gallup's Q12 employee engagement items. Thriving -- the highest level of well-being -- is defined as strong, consistent and progressing. Though higher well-being is associated with increased manager engagement for each of the engagement items, it is most strongly related to engagement in a few key areas. Thriving managers are almost twice as likely as managers who are not thriving to strongly agree that they have the opportunity to do what they do best every day and that there is someone at work who encourages their development. Managers who are thriving in well-being are also almost twice as likely to strongly agree that their opinions seem to count at work and that their associates or fellow employees are committed to doing quality work than managers who are not thriving in well-being. In the workplace, engagement and well-being can work together, each increasing the effects of the other. For example, engaged managers are likely to approach their work and life much differently than managers who struggle to get through their day. These engaged managers experience more enjoyment in their day by doing what comes naturally to them, feel their opinions are valued in decision-making, have the support of coworkers who do their best work and are encouraged to grow and develop. They are also likely to have more energy to devote to their personal well-being. Similarly, managers who are thriving in their well-being also approach their work with a different attitude than managers who are not thriving. These thriving managers like what they do each day and are motivated to achieve goals. Their friends and family support them, and they are involved in the community where they live. Further, these managers are confident in their financial security and have the physical energy to accomplish daily tasks. As a result, thriving managers likely have more energy to give their teams once they get to work. Research with the same individuals over time has shown that well-being leads to future engagement slightly more than engagement leads to future well-being. Though the relationship between engagement and well-being flows in both directions, the influence of well-being on engagement outweighs the influence of engagement on well-being. As business leaders increase their understanding of the mutually beneficial relationship between engagement and well-being, they can begin to focus on their role in fostering manager and employee well-being to gain the improved business outcomes that spring from both. Increasing well-being is both a corporate and a personal responsibility. At the organizational level, companies should work to create a culture of well-being in the workplace, reinforcing to managers and employees that well-being is integral to the business strategy. Well-being must align with and be part of a company's policies, structure and incentives. A comprehensive well-being strategy that encompasses all five elements of well-being -- not just physical health -- and that builds on the relationships among the five elements is crucial to improving managers' and employees' well-being. To increase well-being companywide, leaders also must make well-being programs available to managers and employees. Leaders who model high well-being themselves are necessary to creating a culture of well-being, as they set the stage for embedding well-being into company culture. Executives also should consider how to insert activities to increase well-being in managers' development plans and goals. One approach is to encourage managers to set a well-being goal that they share publicly and work toward achieving. This kind of role modeling is valuable because if managers do not display their effort to take care of their well-being, employees will feel restrained in their latitude to do so. Gallup has found that direct reports of thriving managers were 15% more likely to be thriving in their well-being six months later. Attracting and retaining the best managers is the key to increasing a company's financial performance. If their managers aren't engaged, companies risk losing them. Encouraging managers' well-being should be paramount to the manager and to the company. And helping managers take care of themselves by creating a culture of well-being -- one that focuses on all five elements of well-being -- will boost engagement and the business benefits it brings. Results are based on a subset of 2,658 managers obtained after merging two Gallup Panel Web surveys (Gallup Work Force Panel and Gallup Well-Being Panel) conducted between Oct. 8, 2014 and Jan. 14, 2015. The Gallup Panel is a probability-based longitudinal panel of U.S. adults who Gallup selects using random-digit-dial phone interviews that cover landline and cellphones. Gallup also uses address-based sampling methods to recruit Panel members. The Gallup Panel is not an opt-in panel and panel members do not receive incentives for participating. For results based on this sample, one can say that the maximum margin of sampling error is ±3 percentage points, at the 95% confidence level. Margins of error are higher for subsamples. In addition to sampling error, question wording and practical difficulties in conducting surveys can introduce error or bias into the findings of public opinion polls.